"One of them might now be a viscountess but it does not clear the taint of scandal from those frightful Chadwick girls. Why we must deign to entertain them, I will never know!" Lady Bromsley, Countess of Marlbury. No matter what she says, the stubborn man will not back down, but this bluestocking will not give up easily. With the help of her sisters, she must find a way to persuade him to make money another way. 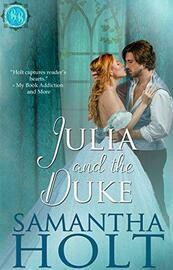 Julia and the Duke is a Regency novella with some steamy content. It can be read as a standalone.